The 2019 Toyota Corolla hatchback has arrived and it is looking better than ever. The hatchback design makes the Corolla more versatile and the sleek and sport body shape allow you to zip through the wind. That combined with the all-new suspension, the Toyota Corolla will deliver an exhilarating experience every time you are behind the wheel. The 2019 Toyota Corolla was created to be a driver-centric car and perform well. Here at Alexander Toyota, our number one priority is getting drivers into a Toyota that they will love for years to come. Each new Toyota model comes with ToyotaCare which covers normal factory scheduled maintenance plan that lasts 2 years or 25,000 miles (whichever comes first). ToyotaCare also comes with 24-hour roadside assistance which covers battery jump start, tire service, towing and emergency fuel delivery. Read below all about the features of the 2019 Toyota Corolla Hatchback! 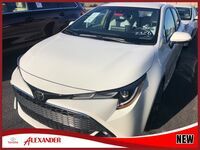 If you have any questions regarding the 2019 Toyota Corolla Hatchback you can contact our sales team here at Alexander Toyota in Yuma, AZ! If you want to get behind the wheel you can schedule a test drive today!